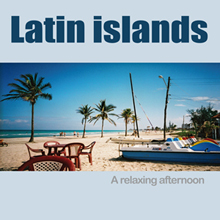 Latin Islands is an album of 8 pieces of music inspired by the relaxing atmosphere of a nice afternoon on a beautiful beach in the latin america region. This album is taking place in our Music Library and will be perfect for synch with your images or documentary. All titles are presented in short length version. Finally, we offer you the possibility to download all our albums on request, by contacting us to get a free promo pack.